While most players are playing Kled top, Kled mid tends to be a niche pick that performs exceptionally well against a variety of different champions. He's ultra-tanky and deals a surprisingly high amount of damage. If you enjoy playing bruisers and don't want to pick up a squishy mage for mid-lane, give Kled mid a try! 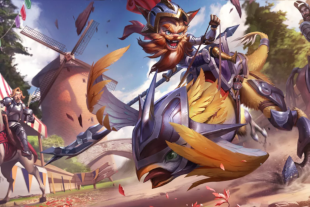 Kled's ultimate makes him incredibly good at roaming and diving bot lane. His Tiamat rush makes it very easy to shove lane and his bulk allows him to tank turrets with ease. He's also a great duelist, which means 2v2 in the river allows your jungler to secure scuttle crab with ease. Mid lane, Kled is generally up against a squishy champion that isn't expecting Kled's burst damage. As a result, Kled can catch enemies off guard when he goes aggressive. His burst damage can be very high, and even without ignite Kled can 100 to 0 enemy champions. As a result of his high bulk, ganking Kled early is very difficult. This makes him great for players who like to play aggressive early but need to be wary of the enemy jungler. His rope harass is also quite safe to use as a result of the long range for a melee champion. Against melee assassins like Kassadin, Sylas, and Talon, Kled performs incredibly well as a result of high burst damage and strength at melee range. This means he can punish enemies as they try and CC, and also prevents them from roaming by shoving in with Tiamat. Before he gets his Tiamat, Kled's early game waveclear is quite weak compared to someone like Nocturne Mid. His passive is good for dueling but not necessarily large scale wave clearing. As a result, if he's up against a high waveclear champion like Anivia, he'll have trouble early game. Playing Kled mid naturally means that your team is going to have to all-in in order to deal some serious damage. If your team's natural strategy is to do this then it'll work great. However, if you have a few teammates that are defensive type players and scared to jump in, changing strategies with Kled mid isn't going to be easy. By far the hardest counter to Kled Mid and Kled in general is really going to be Anivia. Her wall absolutely counters Kled's ability to engage, and her passive makes it more difficult thank usual to dive her and live to tell the tale. Meanwhile, her waveclear is quite good. This means Kled will find trouble roaming without losing out on gold advantage. Mid lane Kled is extremely good as a counter pick, and his roaming power is incredibly good even if he's just doing okay in lane. His ability to snowball games is powerful, and if you're worried about getting killed in lane he's perfect for some peace of mind.